AMHERST, N.Y. (AP) — Tyree Jackson credits his older sister for never allowing the University at Buffalo quarterback to ever get too far ahead of himself. For all the numbers he’s put up in helping the Bulls win a school-record 10 games and reach only their second Mid-American Conference championship game, and amid talk of whether the junior should declare for the NFL draft this spring, Jackson need only to refer to 23-year-old McKenzie Jackson for keeping him grounded. “There’s no room for any of that,” Jackson said, when asked if he ever gets overconfident. The 6-foot-7, 245-pound Jackson is enjoying a breakout year overseeing a dual-threat offense that’s scored 423 points already, 1 short of matching the single-season record set over 14 games in 2008. Jackson’s 25 touchdowns passing are tied for second on the single-season school list, and he’s also scored seven touchdowns rushing. Jackson dismisses the talk by saying he’s focused solely on whoever’s next on Buffalo’s schedule. “Got to keep going. 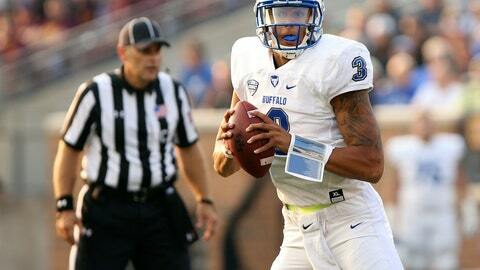 We need more,” he said, when reminded no one had ever quarterbacked a Buffalo team that had won 10 games in one year. Though he’d attract more interest later, Jackson chose Buffalo out of loyalty, and stuck with his decision after Jeff Quinn was fired after the 2014 season and replaced by current coach Lance Leipold. Leipold, a former college quarterback, immediately saw the potential in Jackson. Aside from Jackson’s physical attributes, Leipold noted what he called the quarterback’s “infectious personality” as being something players would rally around. This season, he’s topped 300 yards passing three times, and completed 187 of 337 attempts for 2,605 yards with 25 touchdowns and 11 interceptions. “He hasn’t hit his ceiling yet,” Leipold said. Buffalo’s offense features two top receiving threats in senior Anthony Johnson (45 catches for 820 yards and nine TDs) and junior K.J. Osborn (46 catches for 769 yards and six TDs), and freshman running back tandem of Jaret Patterson and Kevin Marks, who have combined for 1,669 yards rushing and 23 touchdowns. Much of Jackson’s motivation comes from the sting of Buffalo’s 2-10 season two years ago.